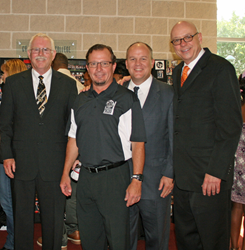 left to right: Bob Conaway, Yamaha; Lamar Burkhalter, Percussion One; Troy Wollwage, Yamaha; John Wittmann, Yamaha. “He seamlessly meshes music education with life lessons, works tirelessly to improve his program every year and gives his performers the ability to play in venues that they would never be able to otherwise,” said Troy Wollwage, Yamaha. Yamaha Band & Orchestral Division today announced that it has presented a Yamaha Legacy Award to Lamar Burkhalter, founder and executive director of Houston-based Percussion One Foundation, a non-profit music education organization that serves middle and high school students and celebrates its 20th anniversary this year. The award recognizes the contributions of distinguished figures in the field of music and music education. Burkhalter, who is a Yamaha Percussion Artist, serves as music director for the Houston Texans professional football team and has amassed considerable experience teaching percussion at the high school and university levels. He founded Percussion One in 1994 to help raise the bar for performance standards among school-age percussionists in the greater Houston area and encourage responsibility, self-confidence and self-discipline, hallmarks of top-tier music education programs. From November to mid-July, the group practices at Lone Star College-CyFair, where they partake in three-hour rehearsals and perform all styles of music, including hand-drumming, ragtime, classical, novelty and marching percussion repertoire. In addition to performing at Houston Texans home games and at college football bowl games, they have appeared on stage with the Houston Symphony Orchestra, Keith Urban and Shania Twain and have served as an opening act for Blue Man Group and Stomp. Percussion One ensembles have also toured Russia and Germany.